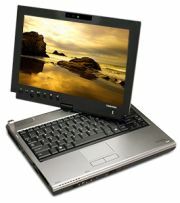 Tiffany Boggs over at Tablet PC Review, has posted her First Thoughts Review of the Toshiba Portege M700. I’ve posted several stories about the M700 in recent days, suffice to say it’s Toshiba’s latest Tablet PC convertible, with a 12″ widescreen (a departure from the previous Portege M400). Last, but not least, she benchmarked it against other Tablet PC/Laptop convertibles in its class.